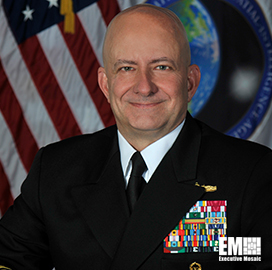 Vice Admiral Robert Sharp is the seventh Director of the National Geospatial-Intelligence Agency. VADM Sharp leads and directs NGA under the authorities of the Secretary of Defense and Director of National Intelligence. He became NGA’s director on Feb. 7, 2019. From April 2016 to February 2019, VADM Sharp served as Commander, Office of Naval Intelligence and Director, National Maritime Intelligence-Integration Office. During his initial flag assignment he served as the Director for Intelligence (J2), U.S. Special Operations Command. His previous operational tours include deployments with USS Ranger (CV61), Carrier Air Wing 2 embarked on USS Constellation (CV 64), and Carrier Group 2 embarked on USS Harry S. Truman (CVN 75). Additionally, he conducted multiple deployments to Afghanistan as J2 of a Special Operations Task Force, leading joint, inter-agency intelligence professionals supporting Operation Enduring Freedom. VADM Sharp’s shore tours include assistant intelligence officer for Commander Naval Air Forces, Pacific; instructor duty at the Fleet Intelligence Center, Pacific; targeting officer on the Joint Staff; Intelligence Operations officer with U.S. Fleet Forces Command; Director of Intelligence for Naval Special Warfare Development Group; Director of Intelligence and Deputy Director for the Maritime Operations Center for Commander U.S. Naval Forces Central Command, U.S. 5th Fleet; and senior fellow on the Chief of Naval Operations Strategic Studies Group. He commanded the Joint Intelligence Center, U.S. Central Command from August 2010 to August 2012. A native of San Jose, California, VADM Sharp graduated from the University of the Pacific with a Bachelor of Arts in English and was commissioned through Officer Candidate School in 1988. He holds a Naval War College diploma and earned a Master of Science in National Resource Strategy from the Industrial College of the Armed Forces in 2008. In addition to multiple personal, unit, and campaign awards, he has been the recipient of the Vice Admiral Rufus L. Taylor award for excellence in instruction, the U.S. Army’s Knowlton Award for Military Intelligence, the Rear Adm. Edwin T. Layton leadership award, and the Naval Intelligence Foundation award for excellence in operational intelligence support to the Fleet.